Bani Walid residents reject NATO-proxy rule, defeats rebels at their gates. The Associated Press reluctantly reported that Libya's rebels began withdrawing from their front at Bani Walid, approximately 85 miles southeast of Tripoli. 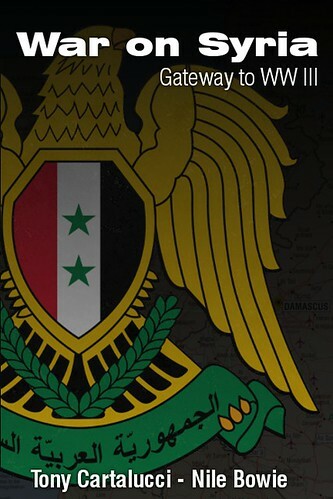 After weeks of humiliating defeat at the hands of the city's residents and despite merciless terror bombing from NATO, the city's residents have prevailed in collapsing the offensive, after numerous, and verifiably ridiculous claims by the rebel forces that the town had "surrendered" to them already. 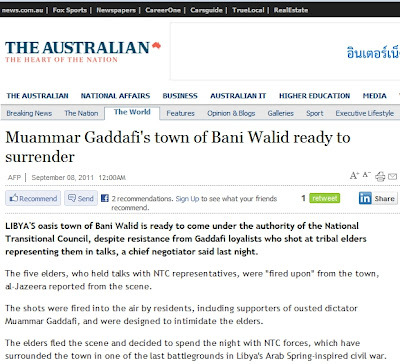 Image: Early September, the corporate media was still faithfully relaying Libyan rebels' constant litany of lies, this one involving the imminent "surrender" of Bani Walid, which would weeks later break the back of the rebel assault and send them slinking back home. By now, the media might afford readers with a cautionary preamble before repeating rebel claims, however, media coverage has only become more surreal. 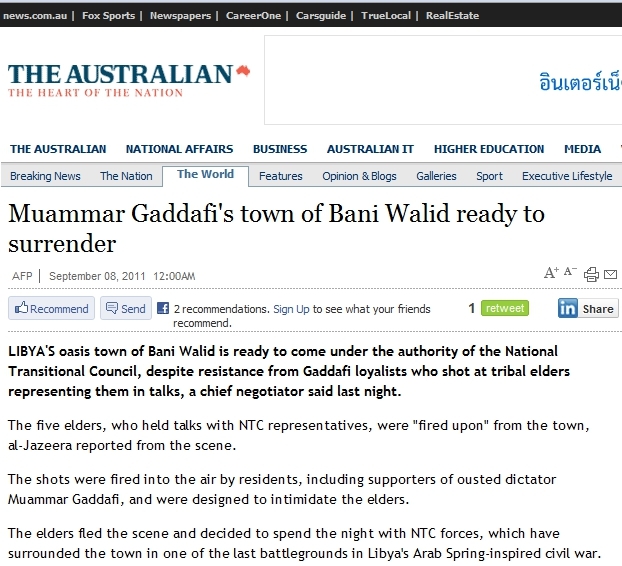 The AP article titled, "Libyans with no leadership quit Bani Walid front," has been quietly buried in the news, along with all other reports regarding Bani Walid, with NATO and the rebels instead focusing unmitigated atrocities against the more accessible coastal city of Sirte. The Oman Tribune reported that Libyan rebel commanders conceded much of the resistance they have been meeting in Sirte and Bani Walid is coming not from the Libyan army, but from city residents themselves. 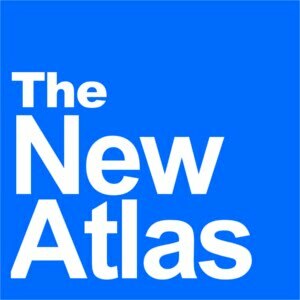 This seriously undermines NATO, UN, US, UK, British, French and Qatari claims that the so-called "National Transitional Council (NTC)" actually represents the Libyan people or that their mission is aimed at protecting "civilians" who are quite clearly disinterested in joining the "revolution," and instead have found it necessary to protect themselves from both it, and NATO. Verified cases of sweeping genocide at the hands of NATO-backed rebel forces, including the extermination and exiling of the entire city of Tawarga, reported by the London Telegraph, offer some insight into what is motivating Libyans to continue resisting what we were promised by NATO was a humanitarian intervention on behalf of Libya's "liberation." Despite a torrent of reports coming from Libya regarding NATO sanctioned atrocities, the corporate media seems intent on helping promote the intervention, where even the Telegraph's article regarding the extermination of Tawarga seems to suggest that residents were "pro-Qaddafi" therefore deserved what they got. In spite of the immense amount of resources being thrown at Libya to crush its resistance to this brazen military campaign of corporate conquest-by-proxy, the Libyan people have thus far put up a robust defense. The people of both Bani Walid and Sirte have resisted for over a month after rebels, with NATO's assistance, purposefully cut the cities off from humanitarian aid, food, water, and electricity - and proceeded to bombard them indiscriminately with heavy artillery accompanied by NATO airstrikes. Now, as rebels slink off in defeat from Bani Walid, and struggle to take even Sirte, lying directly between their supposed "strongholds" of Benghazi and Misrata, their tactical strength to hold the large swaths NATO has cleared out for them is being called into question. Quite clearly NATO's self-congratulatory "victory" declared over a month ago after their attack on Tripoli was premature, and the entire future of their operation is still hanging in uncertainty with the reality that nothing resembling the "protection of civilians" is taking place. NATO's complicity in massacring civilians and providing cover for rebel atrocities already seals their stated goals of "protecting civilians" and the premise of R2P as dismal and irrevocable failures. If by victory we mean NATO's success in conquering and despoiling the nation by proxy, even if starting today everything began coming together, it would still be a Pyrrhic victory.